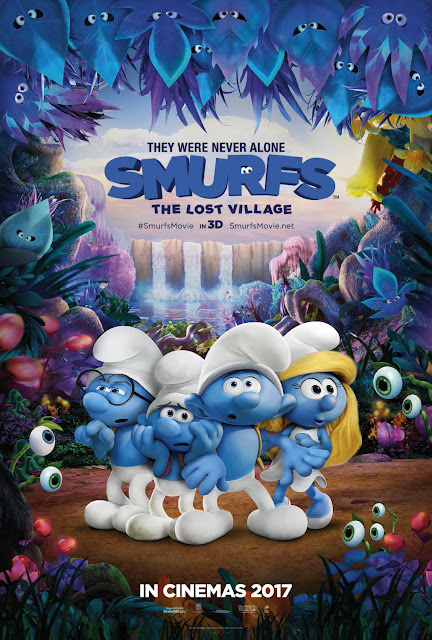 Movie: "Smurfs: The Lost Village"
When Gargamel learns of a lost Smurf village, he plans to find it and capture all of the Smurfs that live there. Now, Smurfette, the only girl Smurf, along with her pals Hefty, Brainy, and Clumsy, set out to find the village to warn these mysterious Smurfs. "Smurfs: The Lost Village" is the latest film from Sony Pictures Animation, who are known for producing movie like "Hotel Transylvania," "Cloudy With a Chance of Meatballs" and the upcoming "Emoji Movie." It is directed by Kelly Asbury, who has directed other animated features such as "Shrek 2" and "Gnomeo and Juliet." 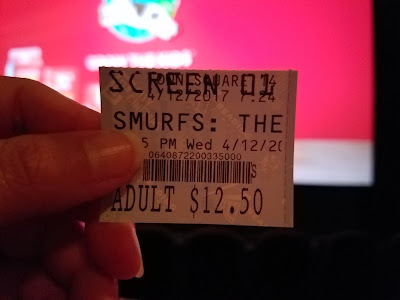 The movie centers around Smurfette, voiced by singer Demi Lovato, who is struggling to find her place as she lacks a specialty like all of the other Smurfs. One thing leads to another and Smurfette believes she has found evidence of a lost Smurf tribe. When Gargamel, voiced by Rainn Wilson, gets a hold of this evidence, he sets out to find the other Smurf village as well. Blaming herself, Smurfette, along with Brainy, Hefty, and Clumsy, voiced by Danny Pudi, Joe Maganiello, and Jack McBrayer, set out to find the new village first and warn the other Smurfs. This animated feature is Sony's latest attempt to cash in on Peyo's 50+ year old creation. None of the Smurf films have been well received critically, and yet, the first "Smurfs" movie from 2011 made $563.7 million worldwide, and 2013's "Smurfs 2" made $347.5 million worldwide. This brings the combined worldwide box office total to $911.2 million across the two installments. BigJ and I are absolutely dumbfounded by these numbers. People who have seen the quality of these two pictures will know they are cinematic wastes of space. Parents should not be showing their children kids movies that are so, so dumb, but in the language of Hollywood, their prior monetary success means one more of these movies was inevitable regardless of whether of they were wanted or not. Despite there being a little bit of a loss of steam between the first two movies, Sony figured they had enough of a fan base left to squeeze a few extra bucks out of this dwindling franchise. "Smurfs: The Lost Village" honestly feels like little more than an attempt at a cash grab, right down to the actors and actresses working behind the scenes in voice form. This movie is corporate filmmaking at its worst. We can picture it now: an executive at Sony thought to themselves, "you know what? 'Girl power' movies are really popular right now, so let's try to craft a Smurfette-centered flick where she gets to be the hero in a...race?...species?...critter kingdom?...dominated by men." Even as self-described feminists, we agree the message is super ham-fisted. Instead of making something featuring genuinely good storytelling, Asbury and writers Stacey Harman and Pamela Ribon have made something flat, unimaginative, and rather lifeless despite it being bright, colorful, and shot for 3D. This is a rather dull film with humor and a narrative written to appeal to toddlers with a G-rated sensibility rather than a movie the entire family can enjoy together. It has a basic, clunky story where we as the audience wind up feeling nothing for the characters. With the exception of a few character details, they are so thinly written and so vaguely introduced that by movie's end, we struggled not only to remember their names, but to remember anything about the movie at all. The soundtrack is also atrociously overloaded with terrible pop songs, and it's getting to be overbearing that these movies cast singers into leading roles solely in exchange to get them to record a hit song for their movie, good or bad (see: "Home," "Epic," "Zootopia," and "Rio 2" as a few recent examples). One may argue we're not allowed to complain about a contrived narrative or poor storytelling because this is just a kids movie, but we would argue there are plenty of other movie targeted to kids that don't treat children like adorable little vapid morons. We can usually find some semblance of joy in nearly every animated film, no matter the intended target audience, but as we sat in an almost vacant theater watching "Smurfs: The Lost Village," we were hard-pressed to find even a little enjoyment beyond pretty images being shown in this boring, cliche-riddled, more than generic kids movie with awful writing and expected, dreadful jokes. We seriously counted the minutes for this one to be over.